Results from the RAISEup Texas demonstration project show that any school can benefit from this powerful whole school transformation model. However, schools where many students are struggling to improve provide the greatest opportunity for large scale change, and thus for impacting the overall student population in the region. E3 Alliance spent more than a year identifying and adapting what we believe to be the most robust student academic growth model in the country to Texas students. This complex statistical methodology identifies academic peer groups of students from across the state who performed the same way in the past, then determines their relative growth this year in order to rate the overall growth for students achieved at a school. E3 Alliance is the only organization in the state who can apply this academic growth methodology, called 3D Growth. We have used 3D Growth data to identify middle schools from across the region which have the greatest potential for improvement, and thus provide an objective way to make the largest possible impact on the population-level performance of our students. 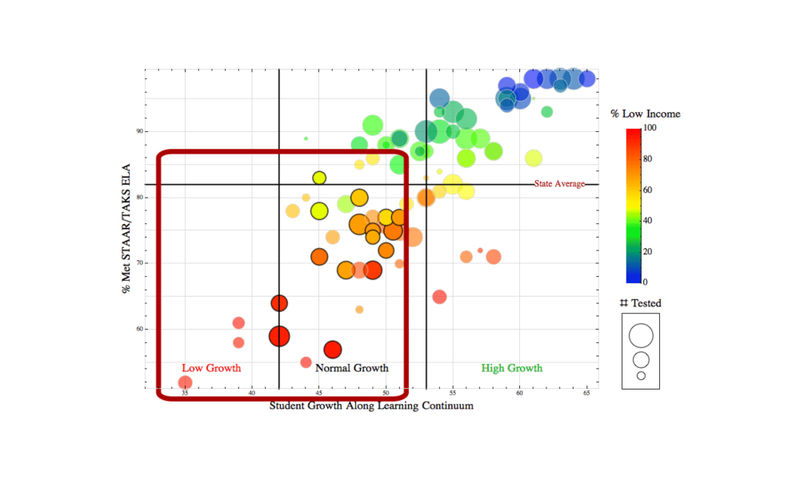 This bubble chart shows student academic growth for every middle school in the region. Schools with high concentrations of struggling learners and low academic growth as compared to other middle schools across the state will be targeted as expansion schools.